Looking down, I couldn’t help but laugh. As an avid mountain biker, I was skeptical about these insanely oversized tires, but everyone warned me that fat biking was fun. My bike’s big, fat balloon tires rolled smoothly on hard-packed sand as I dodged sand dollars and bits of crab shells. To my left, the deep green, forested hillsides towered over us. To my right, the cold waters of the Pacific Ocean lapped up on the flat beach that we rode on. This IS fun. Welcome to fat biking on the Oregon Coast. 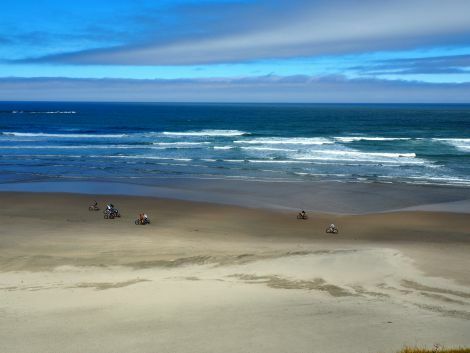 For five days, a group of intrepid writers, entrepreneurs, and cycling tour operators — Cog Wild, Limberlost, Pedal Bike Tours, and The Bike Concierge — set out on the first ever Oregon Coast Fat Bike Expedition. This was a scouting mission to discover how many miles of beach are rideable by fat bike. This was a far cry from road biking Highway 101 or shredding some of the mountain bike trails. It was an adventure in sand, salt, and a healthy dose of clam chowder. After camping at Harris Beach State Park Campground, we woke to a bright, blue-sky day, ready to explore the very southern third of the coastline, from balmy Brookings to Coos Bay. Plan to ride north to south! The prevailing summer winds rip down the coast from north to south, so during the summer, plan to ride from north to south so you can use that wind to your advantage as a tailwind. In the winter, these winds can go in the opposite direction. Your best bet is to check the weather forecast or call a local bike shop for local information. Find flat, wide beaches with hard packed sand. While fat bikes can still roll in deep sand, they are definitely more fun (and less work) in hard packed, wet sand. Low tide conditions will gain you even more real estate to ride on. From March 15 through September 15, several stretches of southern and central Oregon beaches are closed to protect the threatened Snowy Plover during their nesting season. Be sure to check and adhere to any closures here. A key stop was at South Coast Bicycles in Bandon, a bike shop that caters to all types of riding, from the long distance bike tourist to fat bike enthusiasts. Shop owner Karl led us on a fabulous six-mile ride from Bandon’s South Jetty to China Creek at the northern end of Bandon State Park. This stretch was pure fun, as we cruised through natural sea caves, arches and cool geologic formations that dotted the beaches along the way. 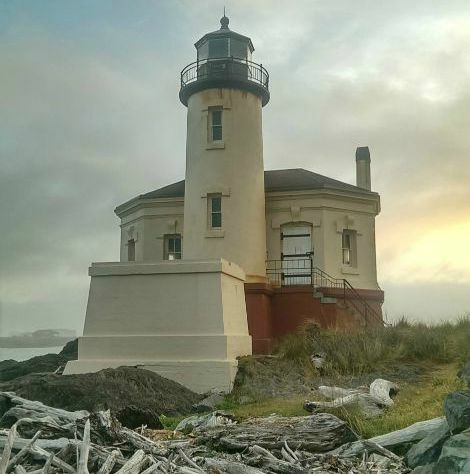 Our afternoon ride took us on a sweet 8.5-mile stretch of beach from Seven Devils State Recreation Area to the picturesque Coquille River Lighthouse. 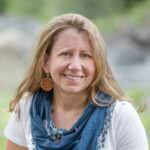 As cyclists, when we aren’t pedaling, were are either eating or thinking about eating. Tony’s Crab Shack in Bandon filled us up with the local catch, along with excellent fish tacos and their famous crab cakes. And if you are looking for endless varieties of tasty artisan cheeses and the largest serving of ice cream you’ll ever find for $2, stop in at Face Rock Creamery. They’ve got you covered. Riding fat bikes is not just beach cruising! 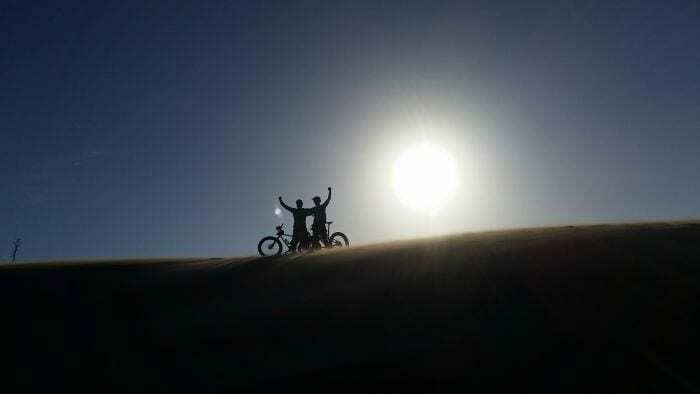 The Oregon Dunes National Recreation Area provided us with the opportunity to shred hard in soft sand. Hike up. Slide down. Giggle. Repeat. More Central Coast explorations took us through a variety of flat beaches and rolling dunes from the Florence South Jetty south through the Oregon Dunes. 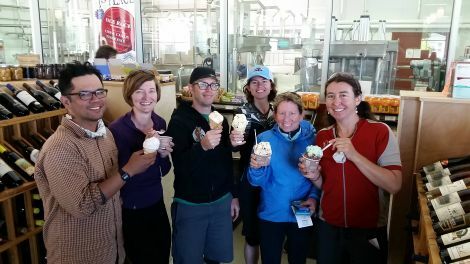 Hungry riders, we found lunch at Luna Sea Fish House and Village Fishmonger in Yachats for more chowder and fish and chips before heading to Newport for dinner, fried cheese curds, and craft brews at Rogue Ales. Notice a theme here? 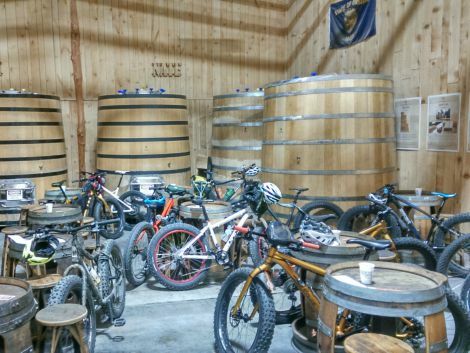 This fat biking stuff gives you quite the appetite. From our campsite at South Beach State Park Campground, there were tons of opportunities to ride short, twisty coastal trails and fast and flat beaches. Elliott and Daniella Crowder, owners of Bike Newport, are a superb resource for all things biking on the coast and offer fat bike rentals and route suggestions. 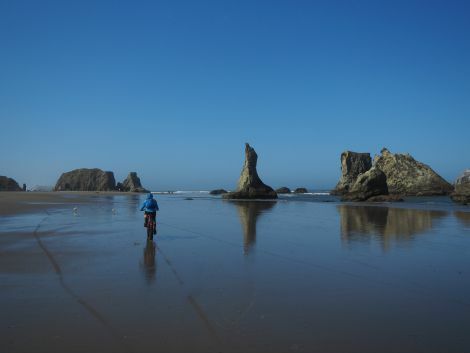 North of Newport, stretches of beach between Otter Rock and Moolack Beach (4.5 miles) and between Agate Beach and Nye Beach in Newport (5.5 miles) all offer great cycling and more stunning scenery. When I think of the Oregon Coast, I picture large, green headlands jutting out into the sea, with stretches of white sand in between. The coast north of Lincoln City is about as scenic as it gets, with said picturesque headlands like Cape Lookout, Cape Kiwanda and Arch Cape. 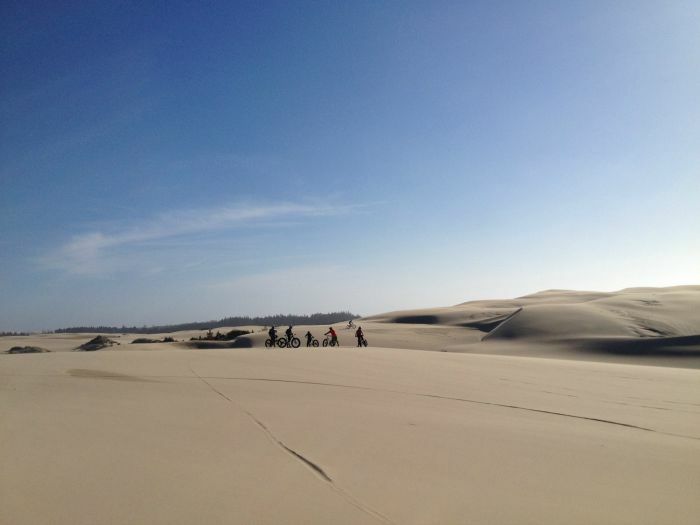 Intrepid riders will enjoy the 15-mile stretch between Pacific City and Cape Lookout, but be aware that you’ll need to navigate around the upper reaches of Sand Lake. It’s doable, but you might get your feet wet! Don’t worry, you can take your shoes off at Oregon’s Surf City, Pacific City and grab a beer and grub at Pelican Pub & Brewery. Day 5 of our expedition. We are feeling a bit gritty and sandy, but still amped to see the most northerly sections of coastline. Our morning ride took us from Cannon Beach south about seven miles, past the iconic Haystack Rock to Arch Cape, skirting Hug Point in the middle—low tide only spot! 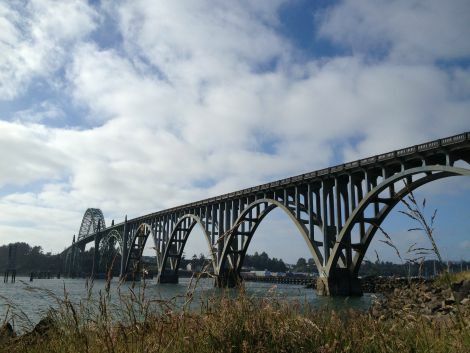 The last leg was a 15-mile spin from Fort Stevens State Park at the mouth of the Columbia River to the seaside town of Gearhart. This stretch was notable for the numerous sand dollars washed up on the shore. The trick is to find one that isn’t broken up by the rough Oregon seas. The verdict: After five days and 100 miles of hard sand, soft dunes, river crossings, beach trails, and many cups of clam chowder, we firmly agreed that fat biking was yet another wonderful way to enjoy the Oregon Coast. 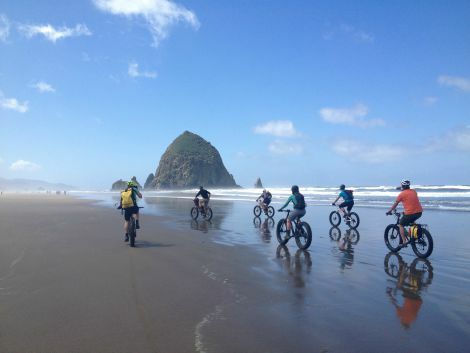 A number of Oregon tour operators will be offering Oregon Coast Fat Bike Tours or shuttle services: Cog Wild, Limberlost, Pedal Bike Tours, and The Bike Concierge. 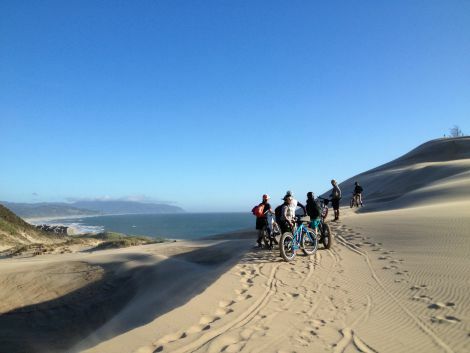 Participating in an organized tour is an excellent way to explore the coast by fat bike!